The youth have always been at the forefront of South Africa’s defining moments, and with Youth Day giving the country a chance to remember the sacrifice and change they brought about in 1976, Samson highlights three of our historic garments that gives a nod to the young generation of SA commemorating the past and inspiring the youth. We all love them. We all wear them but where do they come from? This garment was perfect for physical labour especially for carrying tools and quickly became the standard go to for work wear in factories, mines and construction sites. It wasn’t until women started wearing the dungarees (when they joined the industrial revolution) and children started wearing them that they were made to smaller sizes- giving the dungaree jeans a big face lift. In South Africa, the Samson dungaree is most remembered for the iconic image of Mbuyisa Makhubu carrying Hector Pieterson after being shot at the 1976 Soweto Uprising protest. The denim dungaree trend is a staple of what Samson stands for, and are still as prominent today as they were back in ’76. Dungarees are now a go to for casual weekends of lazing around and are gender neutral. The dungaree’s cousin, the Samson blue overall or boiler suit, was the iconic workwear for those who worked hard to overcome personal obstacles. The boiler suit was equally as popular among the working class a few years ago, usually paired with jackets and some sneakers but were later even more popular with the youth in university. The Kitchen Suit shows respect to the strong youth of South Africa that stood up against the wrong-doings of an unjust system. Workers’ clothes worn during the last century formed part of a range of identification and control measures of African males entering the city for employment. The Kitchen Suit itself was introduced in Durban when the Durban Town Council established casual labour barracks, hostels, beer halls and eating houses for mainly male “native” workers and became the de facto African male servant uniform from the early 1900s to the late 1960s. *The suit was developed into a colour-coded system for various types of domestic work. The white with red trims was for indoor workers; the khaki version for outdoor work; and the navy blue outfit for workers in ablution facilities. The suit is still manufactured and has not changed much in design and style in the past century, though today it is usually worn as a fashion statement. To pay tribute to and the youth of ’76, whose courage, strength and sacrifice we admire, and also the youth of today who continue to uphold the values of justice, humanity and freedom, Samson has an edgy variety of dungarees, kitchen suits and boiler suits that are as fashionable as they are practical. 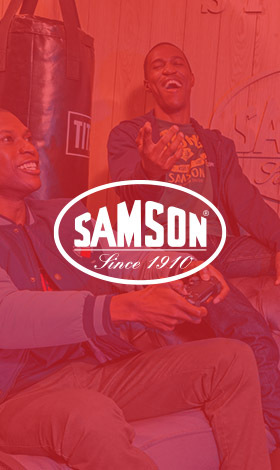 To see our collection, visit our website on https://www.samson-sa.co.za/.